While in Zimbabwe last summer, we were guests in the home of internationally recognized silver sculptor Patrick Mavros. Of the many adventures we experienced on our trip, most of them paled to the delightful encounter we had each evening when the family’s pair of pet Lesser BushBabies joined us during the cocktail hour. Fondly referred to by their native nickname as “Pookies”, these tiny elf-like creatures would spring around the room like ping-pong balls. Raised by hand after being rescued as tiny babies following a fierce storm, we became their nightly playground. From our shoulders to the chandelier and back again, springing 8-10 feet in a single leap, they were totally captivating. The smallest of primates, they have enormous reddish eyes, big ears, fur that feels like chinchilla and legs with an extra joint for leaping. Inquisitively prying under curtains for insects or walking about on their hind legs looking all the world like Yoda, their intelligence was apparent. 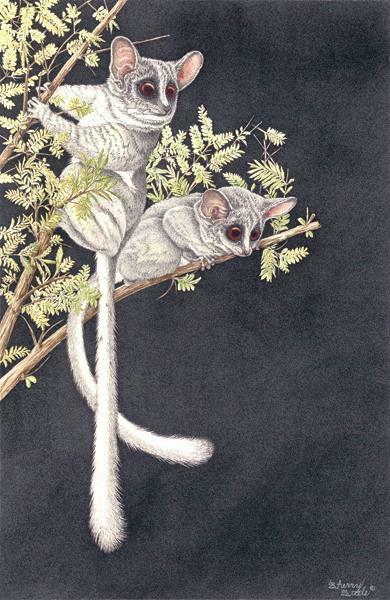 As creatures of the night, the BushBabies presented a special challenge to me and my medium. The only way to design a nocturnal setting for them was to produce a fully darkened background……one dot at a time. Amazingly, the effect created by the tens of thousands of dots (they took me 2 months to complete) is actually more veil-like than a solid mass of black would have rendered. A surprise and a reward for my patience.